Jim Leonard has set himself a real challenge with Battle Hymn: write an intimate epic. Huh? You ask. Here is how it goes: Martha (Suzy Jane Hunt) is a sixteen year old girl with a mostly unrequited crush on Henry Tall (Bill Heck). He is a gangly youngster, with an adolescent’s sense of immortality, and is about to go off to fight in the civil war. Martha boldly seduces him then finds herself pregnant after he, in his splendid uniform, has gone off to war. To boil the essence down to a paragraph: Martha’s mother bled to death at Martha’s birth. Now pregnant, Martha, is thrown out of her house by her preacher father and goes off to seek Henry only to be disappointed – I’ll leave the reason for playgoers to discover for themselves; it is the highlight of act one. She is confronted with the bloody reality of war and concludes that she does not want to bring her child into such a world. In fact, for 150 years she remains sixteen and refuses to give birth. There is no time she can find for her child to come into a world at peace. Along her trek through history she runs into various incarnations of Henry, none of whom is emotionally available to her. The fact that her mother died in childbirth might also have a tad of an influence on her but it is never explored. As I said, it is an intimate epic. Sometimes a successful one and sometimes less sure-footed. Act one is a fairly expository chronicle of Martha’s odyssey of the civil-war years embellished with humorous bits such as when Martha, disguised as a male, though obviously pregnant, is signed up as a soldier. That leaves well over a century to be covered in Act two. In my book, act two is much more successful. It is freewheeling and embodies the spirit of magical realism without taking itself too seriously. Do we really need another reminder that the world is generally a bloody place? 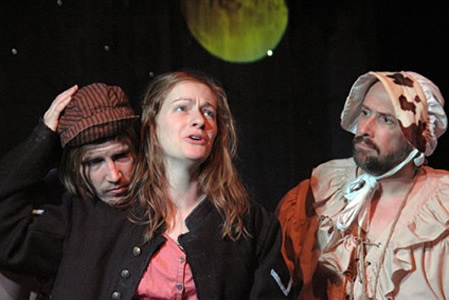 At one point, monumentally pregnant Martha has decided to live the life of a recluse with only her two cows (whimsically played by John Short and William Salyers) as company. Never have two cows expressed themselves as fully or as eloquently, though their vocabulary is limited to but one sound: moooo. Soon afterward, Martha finds herself in San Francisco. It is 1967, the summer of love, and she thinks she may actually have found Nirvana. She goes to bed with a free spirited 20th century incarnation of Henry only to wake up in the ‘80s with a disinterested stockbroker bedmate rushing off to work. When you are talking about the story of someone who remains 16 years old, pregnant, and wears the same increasingly soiled frock for about a century and a half, the morphing lover actually works. Martha is so discouraged she sees suicide as her only alternative. On the brink of a cliff in Marin County her water breaks and the next thing we know, she is smiling and cradling a baby wrapped in an American flag and Barak Obama is president. Go figure. The stagecraft is excellent. Brian Bembridge’s sketchy set of worn wooden elements easily suggests the various settings required by the chronicle and adds to the feeling of fantasy. Michael Levine’s occasional music enlivens the two hour and twenty minute playing time. The four male actors (Bill Heck, William Salyers, Robert Manning Jr.) energetically play multiple rolls with wit and enthusiasm. And Suzy Jane Hunt, with the exception of some problems with projection in act one, embraced her preposterous role with the necessary seriousness to pull it off. So what is the problem? Well, for one, it feels a lot like a work in progress. The two acts are completely different in pacing and tone. The other issue is that the action is stuck in some zone between humor and ‘war is hell’ and, as a result, bears a resemblance to no-man’s land. This is the premier. There is enough imaginative structure one can hope that reworking might bring the two acts into better balance. It is not too late, much of Battle Hymn is original and entertaining and the Ford Theatre is a delightful venue.